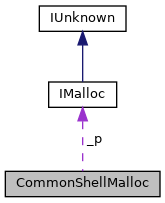 We use a common IMalloc object for all shell memory allocations. Definition at line 222 of file shellclasses.h. Definition at line 224 of file shellclasses.h. Definition at line 235 of file shellclasses.h. Definition at line 229 of file shellclasses.h. Definition at line 241 of file shellclasses.h. Definition at line 246 of file shellclasses.h. Referenced by CommonShellMalloc(), init(), operator IMalloc *(), and ~CommonShellMalloc().